Choosing the right sort of ski equipment can be a bit of a nightmare. To the uninitiated, the rows of skis in the shops all look the same. Do you go for the ones that your mate's got, the ones that match your jacket or just go for the cheapest? You may get the best deal in town, but that's not much good if they're the wrong type of ski for the sport you want to do. Basically, Classic skis are long, thin and narrow with a Nordic camber (a bowing of the ski from tip to tail) to aid the glide and a grip zone to avoid slipping back during the push-off (the kick). The longer and narrower they are the better the glide and the faster they go. As a beginner, unless you have great balance and confidence, it is probably less alarming to start on slightly wider skis before you move on to the skinny racing demons. You now have to decide whether to go for a grip zone that you put grip wax on to yourself (as opposed to glide wax!) or a 'wax-free' ski with an artificial, factory-manufactured (fish scale) grip zone. Wax- free skis are less hassle but are much slower in the glide - both points probably very attractive to the beginner. Skate skis are still thin and narrow, but are shorter and stiffer than classic skis. They do not have any grip zone; the whole ski is dedicated to the glide. 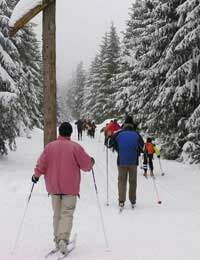 Choosing a skate ski is therefore easier but a word of advice - if you're a beginner don't go for an expensive model until you know that skating is definitely for you. Classic boots are like bedroom slippers - dead comfy but with little ankle support. Skate boots are stiffer, tighter and higher at the ankle (to help balance). Although interchangeable to a certain degree, classic boots will not help your skating style and vice versa. It is possible to buy 'combination' boots but be careful that they are not too much of a compromise (too stiff for classic and give too little support for skating). Be extremely careful that whatever boots you do buy, they are compatible with the boot bindings on your skis. For example, boots manufactured by Salomon only fit Salomon bindings and those by Rottefella only fit Rottefella bindings - irritating but something we have to put up with. Touring skis are very versatile. Most ski tours are based on contouring the mountains but you don't want to be limited by your equipment if you fancy nipping up a peak or two! They are wider and more robust than cross-country track skis but light enough to carry if necessary. Their metal edges and more obvious waisting (narrower in the middle) make them easier to turn on steeper slopes and in deep snow. The skis you choose will be your own personal compromise of ease of straight travel on the flat (thinner, less waisting) matched against ease of turning on the slopes (wider, heavier, more waisting). Touring boots tend to be of light-weight leather and again, only fixed to the binding at the toe. Some bindings, however, may have an additional cable running round the back of the heel to aid turning the ski. They are stouter than cross-country boots and are a compromise between comfort and ankle support. A telemark turn can be performed on any Nordic ski - the experts even being able to demonstrate it on skate skis! However, most telemarkers now use downhill alpine carving skis but with telemark bindings on. So you can go ahead and choose from all the latest cool colours and funky designs of the alpine skis! The boots are plastic but with more toe and ankle flexibility than alpine boots. The bindings are a cable round the heel similar to those used with touring skis but can also be 'step-in' and 'quick-release' just like alpine bindings. Anything you can do using alpine boots and skis, you can do with telemark boots and skis! The lighter weight of telemark boots, skis and bindings also make the skis perfect for ski-mountaineering. A word of warning though, Nordic touring and telemark skis don't have ski brakes, so for safety on- piste (and if you don't want to lose your skis in the powder) make sure that you have ski leashes in place. What is Nordic Skiing all about? Which Nordic Ski Discipline is for Me?